Red Lion American Legion Riders Throw Some Love Our Way! 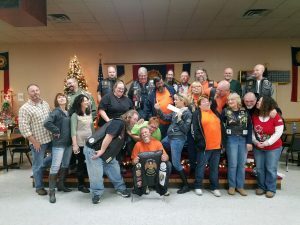 On December 10, 2017 Roots for Boots CEO, Christy Lucas – accompanied by Roots for Boots Riders Officers, Heater and Sherri Linebaugh and John and Cathy Wolf – all visited the Red Lion American Legion to be presented a generous donation from their Riders. With grateful hearts, we showcased some of our most notable accomplishments and assured them that the money will go to where it is intended … to assist veterans, active duty or military families in need. Huge thank you to this fabulous group of Patriots for helping us to bring our Mission to fruition!